NEW VIA RAIL BOOK: Contributor Delivery at Kingston! With a great team of contributors aboard for Trackside with VIA: Research and Recollections, a particular pleasure is making sure their contributions are rewarded with a complimentary copy. 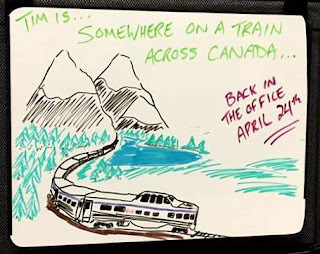 Even better is a delivery to a contributor who's riding the train through Kingston! Contributor Tim Hayman was doing just that, aboard No 65 after arriving Montreal on No 15 and before departing Toronto on No 1. I showed the book to the attendant who let me off, and as we were chatting, the other Business Class attendant came over and said, "Are you Eric Gagnon?" I said no, but I'd just met him on the platform. He said, "Oh no, I wish I knew!" He says he's been following the development of your latest book (he has the others) and is set to order this one, too! Tim reached Vancouver today! Before leaving, he left the above creative whiteboard artwork (above).